There was no giant creatures, or crazy aliens, or mass destruction, Superman #39 was a quieter issue, though really showcased the inherent goodness in Clark Kent. 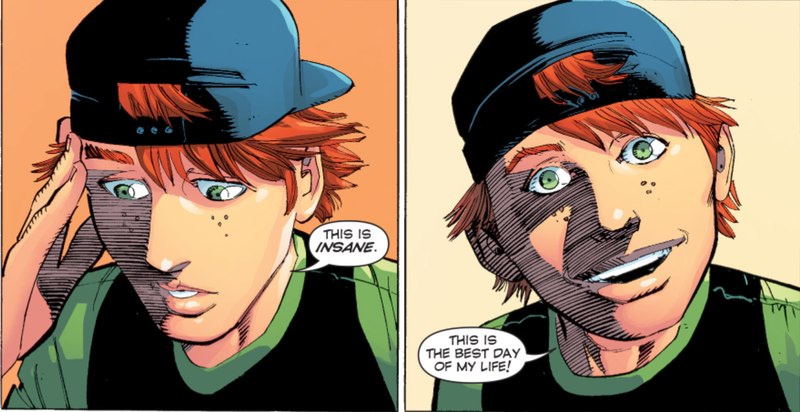 And that is what Superman’s really about, and the new dynamic between Jimmy Olsen and Superman is looking like it’s going to really be one of the strengths of the Superman comic moving forward. So let’s get into the review of Superman #39! After the big issue that was Superman #38, issue #39 explored the consequences of Superman’s new Super Flare power, him being human for a day. 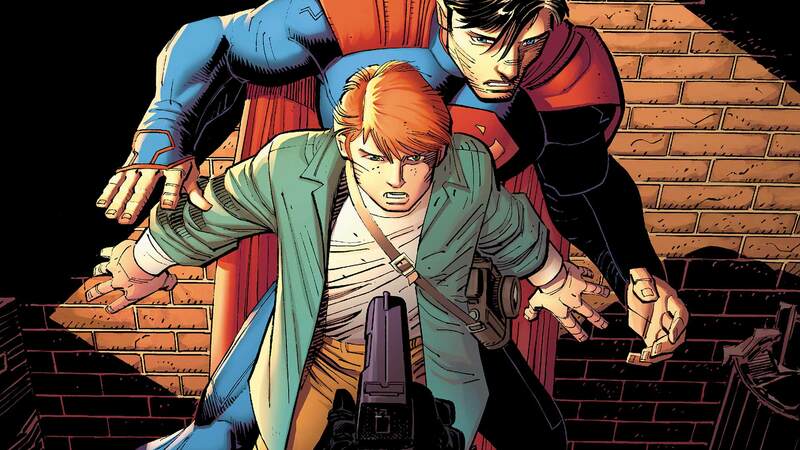 Tagging along with him is his new buddy Jimmy Olsen. 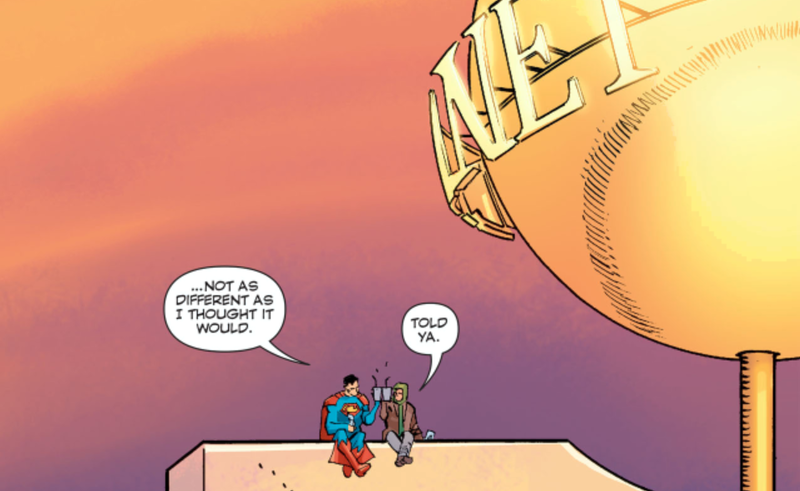 Of course in last month’s issue, Superman told Jimmy his big secret, and I’m glad he did. Jimmy has always been the adorable, younger brother-type to Clark, so it’s great that the relationship between the pair has strengthened. I’m sure the two of them are going to have a lot more D&Ms on rooftops in the future. The strength of Superman 39 was emphasising just how good of a person Superman is. He doesn’t have his powers, but that doesn’t mean he will just hide out in his crappy apartment for a day until his powers come back, no he’s still a hero. From rescuing falling children, to stopping a hostage situation, unlike his World’s Finest counterpart, Batman, Superman is a people person, and he will always been looking for ways to help people, even without his powers. It’s great that Jimmy is now in the know, but it kind of just makes Lois seem like a really big idiot for not knowing. Say what you will about Man of Steel, but they nailed it by having Lois actually figure out that Superman is Clark Kent. I know Clark talked about how his glasses change the shape and colour of his eye, but still, Lois, you really need to figure it out soon. Issue #39 was Geoff Johns’ last issue, in his short Superman run. Superman may have not punched anyone, but where it lacked in action, it gained in heart. I would have liked to see Clark go on more adventures without his powers, but the fact that he now has this power that can do this to him, means we will probably be seeing a similar issue like this again sometime soon. But then at the same time, who knows what DC’s plans are for Superman in the post-Convergence era. I’m sure you’ve all seen the artwork of Superbro, with his casual new costume, and jock haircut. Hopefully that is all temporary, and we go back to the good old Superman we know and love. Oh and we still don’t know anything about the mysterious hooded figure that lurks around. He sent a blank book to Clark, stating the future is unwritten, but him and his friends will see it soon enough. What the heck does that mean? Is this going to connect to Convergence? Maybe, but I really hope they move that plot along quicker in the issues that follow, because they’ve really been dragging out the whole mysterious hooded figure. The DC June solicitations revealed that a ‘Truth’ story arc will be crossing over with the Superman titles, so perhaps it has something to do with that. Maybe it will explain why Superman is now looking ridiculous in jeans. I guess we’ll have to wait until June to find that out. Great review. Nailed it concerning the role of Jimmy and the need to do something with Lois soon.